CHICAGO-NEW YORK 1 HOUR 51 MINUTES 53 SECONDS. 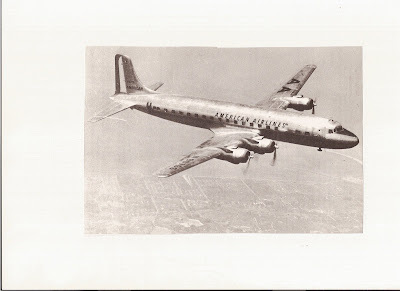 On a recent Sunday, a huge American Airlines DC-6 streaked from Chicago to New York in 1 hour, 51 minutes, 53 seconds, establishing a new record for transport aircraft between the two cities. As always with ships of American Airlines, the Flagship Illinois’ four 2100 H.P. engines were lubricated with Sinclair Aircraft oil. Marking another milestone in the rapid growth of American aviation, this amazing flight, made with 52 passengers aboard showed an average speed for the new DC-6 of 402 MPH. It s significant that , in this new triumph of American Airlines operations, Sinclair oil played a significant part in providing safe, sure, dependable lubrication, when groundspeed often exceeded 490 MPH. So the article read in the 1947 issue of Aviation, Maintenance & Operations magazine for 1947. 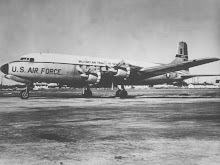 The mentioned American Aircraft, “The Flagship Illinois” N90707 was a DC-6 built in Santa Monica, C/N 42860 April 18, 1947. She was later named the “Aircoach Illinois” and flew until 1972 when she was scrapped. Lets take a comparison for flight times between a current run flight from Chicago O’Hare Airport, and New York’s LaGuardia airport. At the present time American Airlines runs 15 flights daily on this route. Utilizing MD-80 and 757 aircraft. In 1954 American Airlines flew flight 206 utilizing DC-6 equipment departing Chicago 6:00 pm with a non stop to LaGuardia arriving at 9:45pm. A flight time of 2:45 minutes. The probable route of flight was Chicago Midway McCOOL FM /GREEN AIRWAY 3/ GOSHEN/ TOLEDO/ YOUNGSTOWN/ PHILIPSBURG/ SUNBURY/ ALLENTOWN From over Allentown the flight will proceed via se leg of the Allentown Range, over Metuchen fan marker to Keport intersection, thence sw leg to LaGuardia Range to the Coney Island intersection at 7000 feet. Thence to LaGuardia. You may ask how I know this route, well I have a bunch of airway , maps and flight plans from the era. In a later post I will give a complete flight from Chicago to New York. On a DC-6. In 2008 American Airlines flies Flight 398 a McDonnell Douglas MD-82 with a scheduled departure of 06:11 am at Chicago O’Hare and an arrival time at New York, LaGuardia of 08:41 am. For a total flight time of 1:40. The route of flight for Flight 398 is via J MOBLE ADIME GERBS J146 ETG MIP3 arrival, that is a Milton 3 arrival to LaGuardia. This flight climbed to flight level 330 and stayed there for 16 minutes before beginning its descent. This info I got from the web site Flight Aware, and excellent web site for tracking modern airlines live. What is interesting about this comparison is that taken on the average for the present day flight, for a four day average, the time Ramp to Ramp for the flight is roughly 1:30. whereas the flight time for an average flight in the 1950’s on a DC-6 equipment was 2:45 minutes. Although this flight in 1947 made the run in 1:51:53, not bad for an old piston run aircraft running over the ground at 490 mph. That’s only 20 minutes longer than a fast moving sleek jetliner cruising at 33,000 feet on the same route.